Does your little one turn into a full-on ninja at mealtime? As soon as you turn around, pureed peas are winged across the room and every attempt to put food in his mouth ends with an expert block? 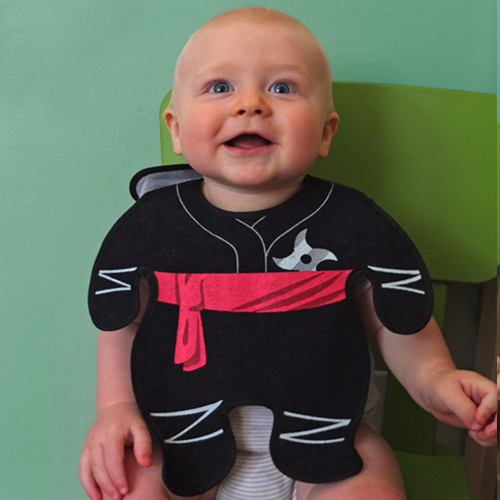 Dress that little martial artist for his role with our Ninja Bib! The black ninja bib is shaped like a full outfit, detailed with a red belt and throwing star for the full effect. With its Velcro fastener, at least you can rest assured putting it on him will be easy. As for his stealthy food avoidance maneuvers, be ready for anything! Most people think babies are these cute little slow things, spitting up and throwing food, but they’re wrong. Ninja Baby Bib proves that the ancient art of the ninja hasn’t been forgotten and the next generation is ready and waiting to pounce once your back is turned…plus, it’s really cute. No one will ever see it coming. 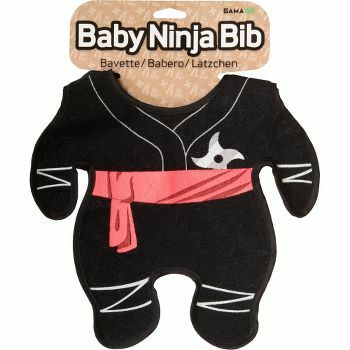 Who Would Love Ninja Baby Bib? Our first thoughts naturally point to ninja babies, but there’s probably a wider audience. We’re sure parents who think their children are destined to be the President or a geniuses with “knowing” eyes will love a Ninja Baby Bib, because it’s obvious their child is already a ninja. Should we worry our baby will become a ninja? Of course not, unless you dishonored him and his clan. Did you put those photos of him playing with the pudding on Facebook? Yes. You can always tell when he’s about to strike because there’s a sudden calm and angelic sound of baby laughter…but where’s it coming from? Will this fit most babies? This bib has a Velcro strap that comfortably fits around your baby’s neck. Unless your little cherub is an infant body builder, the bib should fit beautifully.